Dhaka, Aug 25 (Just News): Thousands of Rohingya Muslim refugees on Saturday marked the one-year anniversary of the attacks that sent them fleeing to safety in Bangladesh, praying they can return to their homes in Myanmar and demanding justice for their dead relatives and neighbors. More than 15,000 gathered in the morning on a hilltop in the Kutupalong refugee camp, part of a sprawling web of settlements that are now home to nearly 900,000 Rohingya who have fled Myanmar. “25th August — Black Day,” one banner announced. Some of the protesters carried paper flags of Myanmar. Newly setup shops inside the camp were closed during the protest that continued for several hours. The camps exploded in size last year when Myanmar’s army launched a wave of anti-Rohingya attacks about Aug. 25, and some 700,000 Rohingya began pouring across the border. Thousands were killed in the violence. 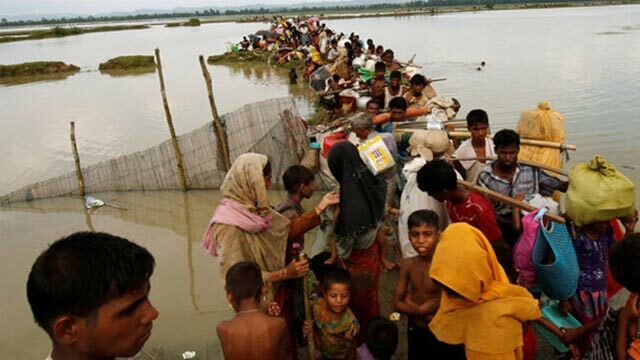 But many doubt they’ll ever be able to return despite more than a year of talks among Myanmar, Bangladesh, the United Nations and international aid agencies. Myanmar insists the Rohingya can return, and has built a series of camps for them, but few believe they would be safe there, or that they could finally be accepted as citizens. While Rohingya have lived for centuries in Myanmar, they have long been treated as outsiders, Muslims in a largely Buddhist nation who are denied citizenship and many basic rights. Many in Myanmar ridicule them as “Bengalis” who came illegally from Bangladesh. Most live in poverty in Myanmar’s Rakhine state, just across the border from Bangladesh. Over the past couple decades, over 100,000 have fled into Bangladesh in earlier waves of violence.